Waterfalls are often quite spectacular, cascading down the sides of hills or mountains - such as Taylor Gyhll Force in the Lake District. They can make us aware of the power of creation, the power of God and our own frailty. But they can also be inspiring and majestic. In the book, 'Hinds Feet In High Places', there is a 'mighty', 'unspeakably lovely', 'majestic' and 'terrifyingly lovely' waterfall described in the chapter 'The Place Of Anointing'. Ezekiel 1:22-24 (MSG) - Over the heads of the living creatures was something like a dome, shimmering like a sky full of cut glass, vaulted over their heads. Under the dome one set of wings was extended toward the others, with another set of wings covering their bodies. When they moved I heard their wings—it was like the roar of a great waterfall, like the voice of The Strong God, like the noise of a battlefield. When they stopped, they folded their wings. 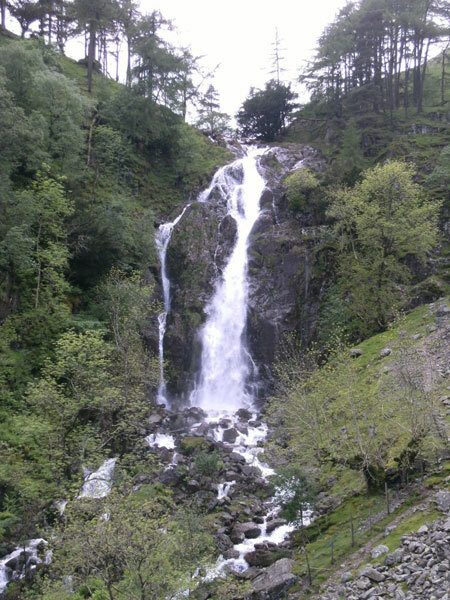 The picture below was taken at Taylor Ghyll Force in the Lake District, England. The noise is quite inspiring as the water rushes down into the valley below. It's a bit steeper than the picture suggests. The water is constant and as it crashes down over the rock, it shapes the rock and continues downstream from its source to eventually hit the sea. In Ezekiel 1, Ezekiel speaks of how he was caught up in a powerful vision of God. In this vision, he saw four creatures, with different faces, glowing like bronze, with tongues of fire and bolts of lightning. It must have been an awe-inspiring and terrifying vision. These creatures moved along via a series of incredible wheels. Ezekiel then goes on to explain about the wings of these creatures and the noise like a waterfall they made - like the voice of God. In 1 Kings, the prophet Elijah also had an encounter with God, but God spoke to Elijah on that occasion in a still, small voice. This is usually the way that God speaks, quietly and gently into our spirit / heart and we get a 'knowing' of something (you get to understand this better as you grow as a Christian). But God is also all-powerful and sometimes he speaks like the crashing of a waterfall. His Word is described as a hammer that can break rocks (Jeremiah 23.29). Don't forget how powerful God is. Whatever your need, God's Word has an answer and God is in charge of everything. Thank God today that he has already answered your needs, that he is for you if you're a Christian following him and that he is shaping you and working all things for good. (see Romans 8.28). A Prayer: Lord, thank you that you speak through your Word and that we can hear your voice. Thank you that even creation shouts your praise. Thank you that today, your Word is a hammer that can break chains, set people free and bring deliverance. Thank you that if I love you I can be sure that you have the answer to my prayers and are working all things for good. Amen.